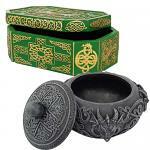 This Cleansing Box is specifically for cleansing the energies of other people who engage with your bindings and tools. If you share your bindings with loved ones or friends you will can use this Cleansing Box to remove their energies from your bindings so they are fully restored to their original energy cycle. As with all Creepy Hollows tools this works with any binding from any practitioner and works even with daily objects like your phone, jewelry, desktop, altar or nightstand decorations, etc. This Binding Box binds vessels (empty, enchanted and/or spirited) with spells for Third Eye Activation, Psychic Power, Visions, and Intrinsic Knowledge! You will receive a Binding Box which allows you to bind amulets that when placed under the pillow will bring you a night of lucid dreaming... and the dream will be recorded to the amulet you place under your pillow so you can revisit the lucid dream and discover further details! This way you can identify the important information that is being given to you and uncover vital details about your life! This is an amazing opportunity that allows you to learn the benefits and powers of psychic awareness and the connection you share with the Universe. Place any vessel in the bag to have it bound with ten psychic visions at a time. The visions will parse out over a 30 day period. The visions will come to you in vivid color and action so you know they are not simply thoughts. The visions may be of anything at all related to your life. You can bind these for yourself but if you are going to bind a vessel for someone else so they can have visions you will need a strand of their hair and a vessel. You should create only one of these psychic beacons at a time as the visions can be plentiful and intense. This bag provides you the support you need to make your resolutions in life become a reality. Each of us takes the new year to heart and wants to have the opportunity to try new things, correct past mistakes, overcome issues, and have the fresh perspective of 365 to make things greater. 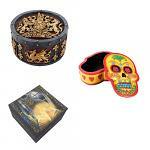 If you are a lover of the Dark Arts you will find yourself enamored with this Binding Box. 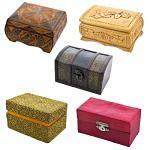 You will receive random visits from Dark Arts spirits from the Spiritual Realm when you use this box. When you place any object in the box it will become a beacon of attraction for Dark Arts spirits who wish to visit you and interact with you. In this you will find incredible experiences that will show you just how exciting the world of Dark Arts can be! This is a Dark Arts Binding Box that imbues vessels placed inside with 4 spell blends from Ash! Place any object in the bag to have it imbued with an enchantment that imparts wondrous love energy through your 3 bodies all the time. This can be for connecting with the Universal level of love, feeling & identifying with many different types of love energy, and awakening your mind, body & spirit to the power of love. You can create up to 3 amulets together at a time. This Binding Bag creates an amulet which is an Astral embodiment of starlight. These amulets are quite powerful as they possess a blend of enchantments that bring Astral Creation energy to your life. When you make these amulets you should spread them around your home. The starlight bindings can help you do many things; resolve conflicts, recover from disappointment or setback, encourage forgiveness and grace, surround you with comforting & soothing energies, open your mind to Astral energy & power, create stronger bonds and connection with Astral spirits & entities, ethereal protection against malicious forces in the Universe, sleep well with personal dreams of yourself & your future. The starlight enchantments create powerful amulets that will serve you well through your life and help you to maintain that close connection between your mortality and divinity in the Universe around you. This enchantment allows you to bind any object with the power of the ether; the universal force within the astral realm that absorbs & is everything. This is an extremely powerful energy that is a source or origin energy. This means it has a raw & ever-present connection to you and all things around you. This is great for furthering your work with the astral realm, magic, entities, immortals, etc. The Copy Box makes a copy of a spell for a specific person so the binding will be tuned to their energy which gives them greater results in working with the spell. This box is designed and only works for those who are close to you as the box will belong to you and you can copy & tune the spells for loved ones (friends, family, lover, etc). The box makes a copy of a spell onto a new vessel. You will receive our brand new Secret Discovery Binding Box that will bind a blend of spells for uncovering the secrets and mysteries of life, Earth and the Universe. It is truly a discovery opportunity to learn more about the unseen secrets and mysteries of all that exists. It can uncover great powers that exist within you, it can uncover hidden information about those around you, it can impart incredible intrinsic wisdom within you. You will find the amulets you make will reveal surprising and amazing information about you and your existence. 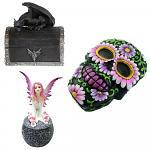 This conjuration bag will Conjure your Totem Animal! A powerful tool that yields endless possibilities this conjuration bag will conjure your present Totem Animal. You can use the bag as often as needed and the power of the bag is in the conjuration and interaction with your Totem Animal as a way to greatly enhance your life and opportunities. Your Totem Animal represents who and what you are at any stage in your life. You will always have a "leader" who is the strongest Totem Animal guide for you and who supports your other Totem Animal guides. This conjuration bag will conjure your leader Totem Animal! 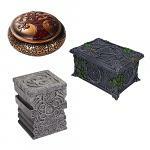 You can Charge any White Arts or Dark Arts spirit, spell, or energy bound vessel in this box! Simply place the vessel(s) inside and leave for 1 hour to have them charged to their greatest ability! 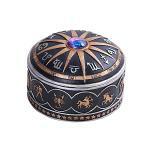 This is a Banishing Box which will banish any entity, spirit, or magick which is attached (or bound by you) to any vessel or item in your home. This will only work with unbound spirits, entities, or magick that has become attached to something in your home, or spirits, entities, and magick that you bound yourself. This will not work with any bindings performed by other practitioners. 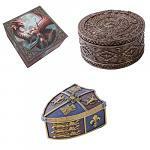 This amazing box is imbued with enchantments which act specifically, and personally, for you to bring you permanent increase and evolution to your life. Which includes your being able to identify your strengths and strong suits, being able to fix or overcome your weaknesses, and developing the aspects of yourself (paranormal and non-paranormal) which can move you to new levels of power, consciousness, and strength. You will find yourself in a new light of evolution that will open your mind & spirit to everything that can and will be. You will find yourself included in the positive pathways of life that yield to you the blessings, gifts, opportunities, and paths that fulfill what you desire. The binding provide a complete rebirth of self into a new state of conscious being and allows for the replication of your bodies. You will follow the instructions provided to work with the incredible power this binding possesses. When the instructions are followed, the binding on the vessel&nbsp;presents you with a wondrous and amazing offering of the rebirth of self into a new state of knowledge, comprehension, and understanding. You feel an ethereal blanket of energy and power come over you and empower you with a new sense of self &amp; being. You find yourself in a state of revelation &amp; thinking in ways you never knew were possible for yourself ever before. You find yourself in a place of evolution spiritually &amp; astrally where you feel taken into a new realization of life. It is a very unique &amp; powerful experience! 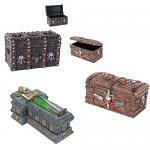 You will receive a Binding Bag which allows you to bind unpleasant memories from this life or past lives. This helps you to put the past where it belongs, promote healing & growth, and resolve issues that are plaguing you and keeping you from moving forward. Memories can be motivation to move us forward and inspire us... they can also be dark clouds that keep us from achieving more. This bag gives you the opportunity to clear memory blockages from your life and achieve true clarity to become who you are meant to be. The memories are not removed; simply suppressed or faded.